Daimler discontinued the Maybach brand, pictured, in 2012 after selling just 200 cars the year before. FRANKFURT (Reuters) -- Daimler will revive the Maybach name with an exclusive version of its Mercedes-Benz S-class limousine that will be showcased at both the Guangzhou and the Los Angeles auto shows in November, a person familiar with the company's plans said. The Maybach brand, which was discontinued in 2012, was once coveted by oligarchs, rap stars and royals. The Maybach S class will be fitted with soft-touch leather and bespoke materials and cost more than double the 165,000 euro ($228,000) asking price of the current S-class flagship, the Mercedes S600, the person said. In January, Automotive News Europe reported company sources as saying Daimler planned to recycle the Maybach name to adorn a flagship S class model. 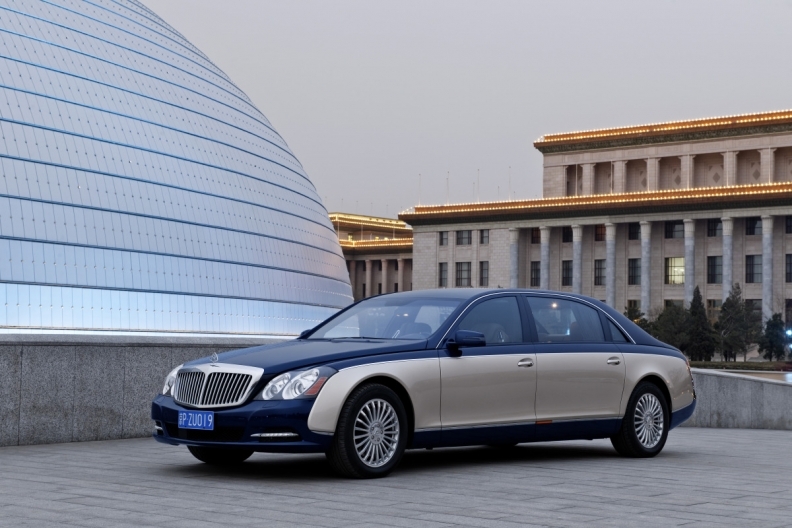 The Maybach S class will help Mercedes lure clients from other high-end brands like Rolls Royce and Bentley and woo a growing class of ultra-wealthy clients in Asia and the United States, the person said. The Mercedes Maybach will have a wheelbase that is 20 centimeters longer than even the extended version of its S class, allowing for extra leg space and making it the longest limousine in the Mercedes range until the expected launch of an even longer Pullman version, the source said. Daimler stopped making bespoke Maybach limousines after efforts to sell cars based on a unique design and costing around $380,000 failed to gain traction with clients. Only 200 Maybachs were sold in 2011, but the cars were coveted by celebrities including Russia's Roman Abramovich, hip hop musician Jay-Z and King Juan Carlos of Spain. A Mercedes Pullman "state limousine" designed to ferry around politicians is also under development and is set to cost up to $1 million in its armor-plated version, said the person familiar with Daimler's plans. The car is expected to have a wheelbase that is a full meter longer than that found in the current S class, to allow for an extra row of rear-facing seats in the passenger compartment. The original Mercedes Pullman 600, launched by the automaker at the Frankfurt auto show in 1963, was over 6 meters in length and had a top speed of 200 kilometers per hour (124 mph). It gained notoriety as a "dictator ship" because it proved so popular with despots. Owners of the Pullman, which had a complex hydraulic suspension that allowed it to hustle along at high speeds on bad quality roads, included Ugandan dictator Idi Amin, Shah Reza Pahlavi of Persia, the Romanian dictator Nicolae Ceaucescu and Yugoslavia's Josip Broz Tito. At the time, Mercedes wanted to show rivals Rolls-Royce and Cadillac that it could make a car that was comfortable even at high speeds, a feat that was difficult for armor-plated vehicles weighing over 3.4 tons.